This great legal reformer was educated at Westminster, and at the age of thirteen proceeded to Queen's College, Oxford. At the age of sixteen he took his first degree in Arts. The mental uneasiness with which he signed the obligatory test of the "Thirty-nine Articles" he vividly recorded in after years. At the Bar, which he soon afterwards entered, his prospects were unusually promising; but unable to reconcile his standard of ethics with the recognised morality of the Profession, he soon withdrew from it. His first publication, - A Fragment on Government, 1776 - which appeared without his name, was assigned to some of the most distinguished men of the day. His next, and principal work, was his Introduction to the Principles of Morals and Legislation (1780), not published until 1789. At this period he travelled extensively in the East of Europe. Panopticon : or the Inspection-House (on prison discipline), appeared in 1791. The Book of Fallacies (reviewed by Sidney Smith, in the Edinburgh), in which the "wisdom of our ancestors" delusion was mercilessly exposed (1824), is the best known, and is the most lively of all his writings. Rationale of Judicial Procedure and the Constitutional Code, are those which have had the influence in effecting legislative and judicial reform. 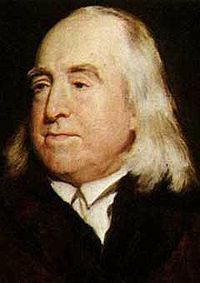 Bentham stands in the front rank of legal reformers; and as a fearless and consistent opponent of the iniquities of the English Criminal Law, in particular, he has deserved the gratitude and respect of all thoughtful minds. Yet, during some sixty years, he was constantly held up to obloquy and ridicule by the enemies of Reform, in the Press and on the Platform; and his name was a sort of synonym for utopianism and revolutionary doctrine. In his own country his writings were long in little esteem; but elsewhere, and in France especially, by the interpretation of Dumont, his opinions had a wider dissemination. In Morals, the foundation of his teaching is the principle of the greatest Happiness of the Greatest Number; that other thing are good or evil in proportion as they advance or oppose the general Happiness, which ought to be the end of all morals and legislation. "What other agents are those who, at the same time that they are under the influence of man's direction, are susceptible of Happiness? They are of two sorts : (1) Other human beings who are styled Persons. (2) Other animals, who, on account of their interests having been neglected by the insensibility of the ancient Jurists, stand degraded into the class of Things. Under the Gentoo and Mahometan religions, the interests of the rest of the animal kingdom seem to have met with some attention. Why have they not, universally, with as much as those of human beings, allowance made for the difference in point of sensibility? Because the laws that are have been the work of mutual fear - a sentiment which the less rational animals have not had the same means, as men have, of turning to account. Why ought they not [to have the same allowance made]? No reason can be given. . . . .
"The day has been (and it is not yet past), in which the greater part of the Species, under the denomination of Slaves, have been treated by the Laws exactly upon the same footing - as in England for example, the inferior races of beings are still. The day may come, when other Animals may obtain those rights which never could have been withholden from them but by the hand of Tyranny. The French have already 91790) recognised that the blackness of the skin is no reason why a human being should be abandoned, without redress, to the caprice of a tormentor. Introduction to the Principles of Morals and Legislation (page 311). By Jeremy Bentham, M.A., Bencher of Lincoln's Inn, &c.; Oxford: Clarendon Press, 1876. It must be added that the assumption (on the same page on which this cogent reasoning is found), that man has the right to kill his fellow-beings, for the purpose of feeding upon their flesh, is one more illustration of the strange inconsistencies into which even so generally just and independent a thinker as the author of the Book of Fallacies may be forced by the "logic of circumstances." Among recent notable Essays upon the Rights of the Lower Animals (the right to live excepted) may here be mentioned - Animals and their Masters, by Sir Arthur Helps (1873), and The Rights of an Animal, by Mr. E. B. Nicholson, librarian of the Bodlian, Oxford (1877). An Introduction To The Principles Of Morals And Legislation (PDF 22mb) by Jeremy Bentham, first pub.1780. This edition 1907.